Don't moose with his fox! A bullheaded moose doesn't stand a chance when a fox decides to make him her mate. A man of few words, Boris has a firm way of saying No, but this determined vixen knows he's her mate. Despite some less than subtle overtures, Jan has not had much success in getting her bullheaded moose to notice her, but all that changes when her life is put in danger. It will take some subtle maneuvering to outfox her moose into admitting he loves her, but this wily vixen is more than ready for the challenge. And if that doesn't work, momma's offered to loan her the shot gun used for her own engagement. I've been looking forward to this one - with it's unusual shifters and great setting. I mean, who has ever read about a moose shifter as the main character? Well, Boris was brilliant. I could totally picture him as a moose and he was the perfect match for the sly little foxy vixen, Jan. Jan was also the perfect personality for her animal. A cross between sophisticated woman and redneck ninja hunter, she was constantly surprising me (and Boris). 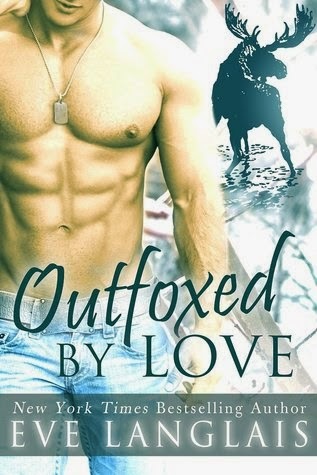 In Outfoxed by Love we get to learn a little bit more about the history of the town and its major inhabitants. Boris and his friends had been in the war - and their part of it wasn't pretty. Boris is plagued by PTSD, an issue that is very real and afflicts so many people when they come home. Eve wrote the situation very well and I felt for Boris every step of the way. His PTSD is his reason for avoiding Jan - even though his moose knows that she's the right one for both of them. Jan would do anything to prove to Boris they were right for each other, and this attitude gets her into a heap of trouble. This is where the story gets beyond good as we get to see the bad guy again, and learn a whole lot about him and why he's set to hurt these people. I can't say too much, but I do know he's a main character in book three - so he's not just going to go away. I really enjoyed this book. Boris and Jan are great characters. Boris is so unique. I don't think I've read a book about a weremoose before. Eve Langlais writes such wonderful characters with humorous and deep personalities.